Toyota Careers Welland | Welland Toyota Welland Dealer ON. 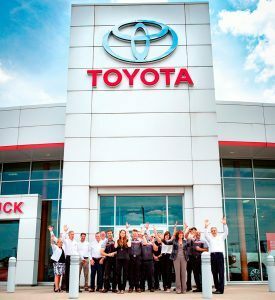 Join our growing team at Welland Toyota located in the heart of the Niagara Region! Come grow with us! We are committed to hiring dedicated personnel who thrive on quality customer service and exceeding customer expectation. If this speaks to you, then you need to speak to us! We are seeking an experienced, highly motivated and knowledgeable, New and Pre-owned Vehicle Sales Representative to join our growing team in our bright and busy dealership in the Niagara Region. This position offers you excellent income potential with full training and management support. You can have confidence in the excellence found in every new Toyota vehicle. Additionally, you will have access to a shared inventory of over 250 pre-owned vehicles. Our sales professionals are empowered, independent individuals that thrive in an environment that encourages autonomy. · Sell and promote our large range of New Toyota and all-brand Pre-owned Vehicles. · Maintain excellent business relationships with our customers while providing the highest level of service. · Independently build and maintain a growing clientele, continuously generating new sales leads and business relationships. · Tend to customer inquiries and needs before, during and after sales. This position will require some evening and Saturday hours. This position offers an excellent compensation package including monthly bonuses, health & amp; dental benefits, car allowance, professional product & sales training, and opportunity for professional growth in a strong team atmosphere selling world-class Toyota products.